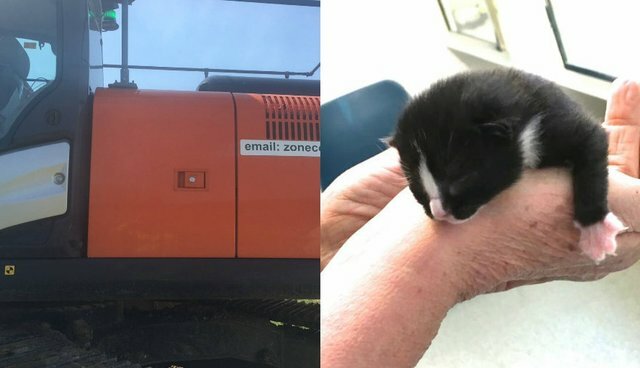 A tiny kitten survived a crazy journey recently after he accidentally got himself trapped inside a digger machine. 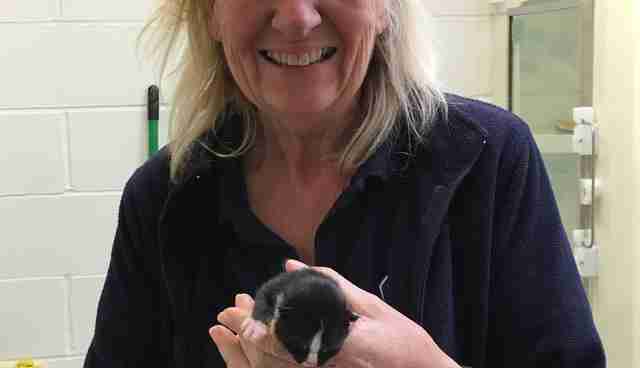 A builder was doing routine checks on the machine after an 80-mile journey across England when he discovered the little kitten in the shovel of the digger. He was only 3 days old. "You expect to find the diesel low or something, but don't expect to see cats inside," builder Martin Dewsnap said in a press release. 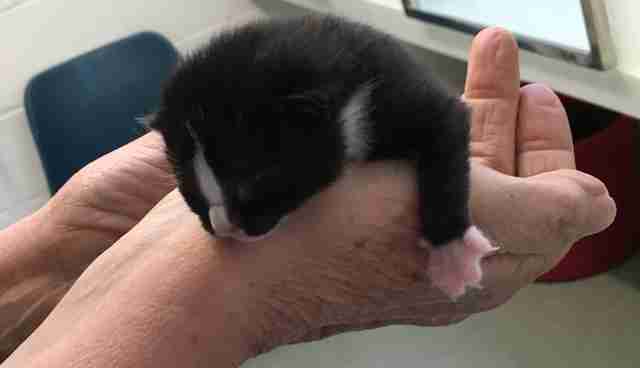 The kitten, later named Digby, was found with his two siblings, who sadly didn't survive the journey. The photo below may be disturbing. Dewsnap knew the little guy might not have much time left and had to act fast. He put Digby in an ice cream bucket and brought him to the Bluebell Ridge RSPCA Cat Rehoming Centre, where staffers were shocked by the whole ordeal. 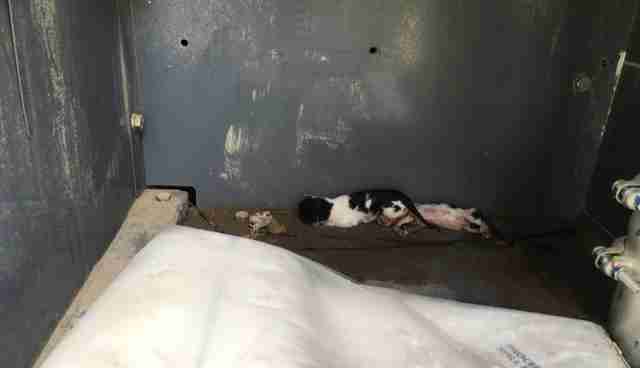 "Digby and his siblings were very, very young so it's not clear how they came to get inside the digger bucket," Myra Grove, manager of Bluebell Ridge, said in the release. 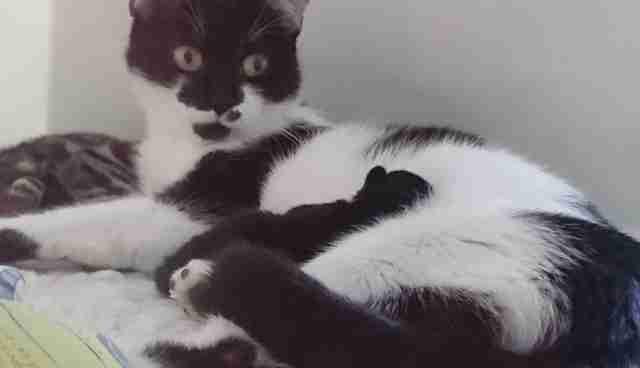 "It's a miracle that even one of the kittens was able to survive without his mother." Once at the center, Digby was checked out and given the care he needed - and also found a new mom, too. One of the cats at the center, Muffin, had just had four babies of her own, and was more than happy to care for one more. Digby is now being loved and cared for by his new mom until he's old enough to be adopted. He traveled so many miles and lost his family, but now he's getting the greatest second chance. If you'd like to help Digby and other animals like him, you can check out the RSPCA donation page to learn more.